Here’s another “green” that has been classified as a “Superfood.” At only 16 calories per two-cup serving, it is packed with nutrients, including vitamin A (great for your eyes and vision) and Vitamin K (known for bone-building). 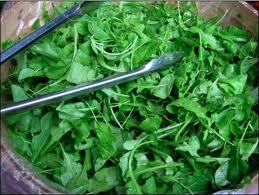 Mature arugula has a spicier, peppery taste, while baby arugula has a milder flavor with the same health benefits. 1. Add arugula leaves to a salad of other greens. 2. Add arugula leaves to a sandwich. 3. Saute arugula leaves in a small amount of olive oil and serve as a side dish, or add to cooked quinoa, brown rice or whole grain pasta. 4. Add 2 cups of arugula to vegetable or lentil soup. 5. Place arugula leaves on a pizza prior to baking. I love arugula especially in salad. I often make a salad with arugula, warm beets, walnuts and goat cheese with a sweet balsamic dressing.